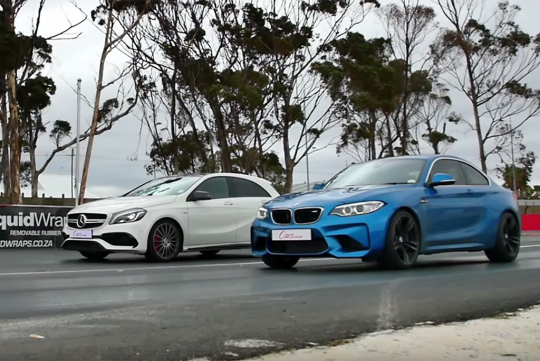 BMW's M2 goes up against Mercedes-AMG's A45 in a drag race. In terms of real world performance, both are very similar-sized sports car even though they don't share the same body shape. However, other than the aforementioned body shape, they differ when it comes to engine size and the way they deploy their power. Both have almost similar power outputs, with the A45 AMG good for 376bhp while the M2 makes do with 365bhp. Even though the AMG has the all-wheel drive launch advantage, the M2 does counter back with a 35kg lighter kerbweight. So, who will be the first to cross the line? Watch the video below and find out! When I test drove the M2 yesterday, I found it felt fairly slow. Purely subjective of course, but I'm disappointed. Never tested the A45.